James Hole's Brewery was located on Albert Street, Newark. Following the move away from dray horses, the brewery invested in the 1920s and 30s in a fleet of delivery trucks. 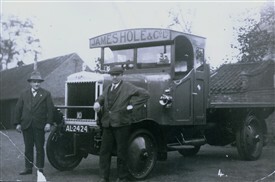 This is a photograph of one of their early vehicles and its driver, Mr Cecil Rawding (right). Mr Rawding was born in 1894 in Norton Disney in Lincolnshire and died in 1982 aged 88 in Newark. His home at the time this picture was taken was at 41 Wood Street in Newark. He worked for Hole's for 25 years before leaving in 1948 to take up driving duties with Wright's coaches in Newark. A strange saga has been revealed surrounding the registration details of the lorry shown in our photograph. Details of ownership about the AL.... (Nottinghamshire) sequence of vehicle registartions are kept at Nottinghamshire Archives, and from these the following story has emerged. AL2424 was first issued on 28th December 1912 - not for a delivery lorry at Hole's brewery, but for a 2 1/2hp Calcott motorcycle owned by Christopher Douglas Fisher Hamilton of Weston Rectory near Newark! On 8th October 1913 the registration was transferred to a Bradbury motorcycle also owned by Mr Hamilton. Then on 1st September 1919 the number was cancelled when the Bradbury motorcycle passed to a Mr Oxspring of Sutton-on-Trent, also near Newark. Mr Oxspring was the proprietor of the local motor garage in Sutton-on-Trent. It was on 2nd January 1920 that the registration number AL2424 resurfaced - and this time, finally attached to the vehicle shown in our picture. It was on that date that the number was reissued to James Hole & Co. Ltd., brewers of Newark-on-Trent, for a new 36/40hp Leyland 4 ton 8cwt Flat lorry painted green. Being just post-war, it is likely, therefore, that the vehicle was one of the government surplus vehicles bought back by Leyland Motors after the war and refurbished to new condition. Holes may have bought it for a good price at that date. The cancellation and re-issue of registration numbers was unusual, but, as we have seen, not unkown. This page was added by Website Administrator on 28/06/2012.